Norwegian nationalistic aspirations in 1814 were frustrated by Sweden's victory in a brief, but decisive war that resulted in Norway entering into a personal union with Sweden. The Norwegian constitution was largely kept intact. Norway legally had the status of an independent state, with its own parliament, judiciary, legal system, armed forces, and currency. However, Norway and Sweden shared a common monarch, and conducted a common foreign policy through the Swedish ministry of foreign affairs. There were largely feelings of goodwill between the two peoples, and the King generally tried to act in the interest of both kingdoms. Norway's economy was more dependent on foreign trade and thus more sensitive to the protectionist measures favoured by the Swedish government at the time. Norway had trading and other links with the United Kingdom but Sweden had closer links with Germany. Norway had more interests than Sweden outside Europe. In addition, Norwegian politics were increasingly dominated by liberal tendencies characterized by the extension of parliamentary democracy, while Swedish politics tended to be more conservative. 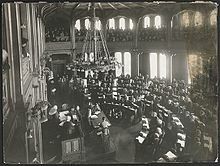 Under the Norwegian Constitution, the Norwegian Parliament, the Storting, was the most powerful legislature on the Continent. The king only had a suspensive veto in Norway, and the Storting resisted numerous royal attempts to be granted the absolute veto that the monarchy had in Sweden. Additionally, by 1884, the Storting's power had grown to the point that a king could no longer appoint a Norwegian government entirely of his own choosing or keep it in office against the will of the Storting. In contrast, the king remained a near-autocrat (at least on paper) in his Swedish domains until 1905, just before the end of the union. When free trade between the two countries was restricted in 1895 by the abolition of the "Interstate laws" (Mellomrikslovene), the economic reasons for the continued union were also diminished. The conflict came to a head over the so-called "consul affair" in which successive Norwegian governments insisted that Norway should establish its own consular offices abroad, rather than rely on the common consulates appointed by the Swedish foreign minister. As the longstanding practice for the conduct of joint foreign policy had been that a Swede always hold the office of foreign minister, the Swedish government and king opposed this insistence, seeing it as a rejection of the throne's right to set foreign policy. While Norway's Liberal Party had pioneered an uncompromising position through the so-called "fist policy," the Conservative Party also came to adopt a strong policy in favour of at least de facto independence and equality within the personal union. Although both parties made efforts to resolve the issue through negotiations, Norwegian public opinion became gradually more entrenched. Both Sweden and Norway increased their military expenditure, and Norway modernized the frontier forts at Kongsvinger and Fredriksten and built a series of new military strongholds along its border with Sweden. Since all the members of the cabinet have resigned their positions; since His Majesty the King has declared his inability to obtain for the country a new government; and since the constitutional monarchy has ceased to exist, the Storting hereby authorizes the cabinet that resigned today to exercise the powers held by the King in accordance with the Constitution of Norway and relevant laws – with the amendments necessitated by the dissolution of the union with Sweden under one King, resulting from the fact that the King no longer functions as a Norwegian King. Initially reacting to this declaration as a rebellious act, the Swedish government indicated an openness to a negotiated end to the union, insisting among other things on a Norwegian plebiscite. However, the Norwegian government had anticipated this, and had already scheduled a plebiscite for 13 August—thus avoiding the appearance that it had been called in response to demands from Sweden. Besides internal changes within Norway, a major key factor that allowed Norway to break from Sweden was the emerging Swedish social democratic movement. In the early years of the 20th century, Hjalmar Branting led the Social Democrats in opposing a war to keep Norway united with Sweden. When the crisis came in 1905, he coined the slogan "Hands off Norway, King!" The Social Democrats organized resistance to a call-up of reserves and a general strike against a war. The majority of Sweden supported a free state of Norway as much as the people of Norway did. The plebiscite was held on 13 August and resulted in an overwhelming 368,208 votes (99.95%) in favour of confirming the dissolution of the union against only 184 (0.05%) opposed. It is one of the most lopsided referenda in history. The government thereby had confirmation of the dissolution. 85 percent of Norwegian men had cast their votes, but no women as universal suffrage was not extended to women until 1913. Norwegian feminists however collected 279,878 signatures in favour of dissolution. Polar explorer Fridtjof Nansen weighed in heavily for dissolving the union and travelled to the United Kingdom, where he successfully lobbied for British support for Norway's independence movement. 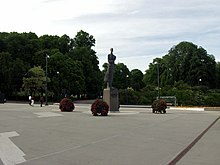 On 31 August, Norwegian and Swedish delegates met in the Swedish city of Karlstad to negotiate the terms of the dissolution. Although many prominent right-wing Swedish politicians favoured a hard-line approach to the issue, historical scholars have found that the Swedish King had determined early on that it would be better to lose the union than risk a war with Norway. The overwhelming public support among Norwegians for independence had convinced the major European powers that the independence movement was legitimate, and Sweden feared it would be isolated by suppressing it; also, there was little appetite for creating additional ill will between the countries. Even as the negotiations made progress, military forces were quietly deployed on both sides of the border between Sweden and Norway, though separated by 2 kilometres (1.24 miles). Public opinion among Norwegian leftists favoured a war of independence if necessary, even against Sweden's numerical superiority. On 23 September, the negotiations closed. On 9 October the Norwegian parliament voted to accept the terms of the dissolution; on 13 October the Swedish parliament followed suit. Although Norway had considered the union with Sweden ended as of 7 June, Sweden formally recognised Norwegian independence on 26 October when King Oscar II renounced his and any of his descendants' claims to the Norwegian throne. In its resolution of 7 June, the Storting had made what is called the "Bernadotte Offer," invited King Oscar II to allow one of his younger sons to assume the Norwegian throne. The offer was at one level an attempt by the Norwegian government to demonstrate goodwill towards Sweden and its royal house, notwithstanding the separation of the two countries. At another, more significant level, it was also intended to reassure the other European powers that the secession of Norway was not a radical revolutionary project, despite the influence of socialists. The continuation of the monarchical system would signal that tradition, continuity and order would be cherished as before in the new country. In this way, Norway aimed to gather support from the other large European countries which, with the exception of France, were all hereditary monarchies. Unlike the declaration of independence, the Bernadotte Offer was a matter of contention and controversy within the Norwegian government. Five socialists in the parliament voted against the idea of having a monarchy, and the finance minister Gunnar Knudsen, a republican member of the cabinet, resigned over this issue. It was known that King Oscar II was not amenable to accepting the Bernadotte offer, but the issue remained unsettled until the offer was formally declined by the king when he renounced his claim on 26 October. The King's rejection of the Bernadotte offer had been anticipated months earlier, and already during the summer a Norwegian delegation had approached Denmark with a proposal regarding the 33-year-old Prince Carl of Denmark, the second son of Crown Prince Frederick. Prince Carl's mother, Louise of Sweden, was the only child of King Charles XV of Sweden and niece of King Oscar II himself, and therefore a link to the royal house of Sweden would be preserved. Also, Carl was married to Maud, daughter of King Edward VII of the United Kingdom. By bringing in a British-born queen, it was hoped that Norway could court Britain's support. Another advantage was that Prince Carl was already the father of a son, the two-year-old Alexander, which provided security of succession to continue the line. The Norwegian parliament considered other candidates but ultimately chose Prince Carl. Prince Carl impressed the delegation in many ways, not the least because of his sensitivity to the liberal and democratic movements that had led to Norway's independence. Though the Norwegian constitution stipulated that the Storting could choose a new king if the throne were vacant, Carl was aware that many Norwegians — including leading politicians and high-ranking military officers — favoured a republican form of government. Attempts to persuade the prince to accept the throne on the basis of Parliament's choice failed; Carl insisted that he would accept the crown only if the Norwegian people expressed their will for monarchy by referendum and if the parliament then elected him king. On 12 and 13 November, in the second constitutional plebiscite in three months, Norwegian voters decided by a nearly 79 percent majority (259,563 to 69,264) to establish a monarchy instead of a republic. Many who favoured a republic in principle voted for a monarchy because they felt it would help the newly independent Norwegian nation gain legitimacy among the European monarchies. Following the November plebiscite affirming Norwegians' desire for a monarchy, the parliament by an overwhelming majority offered Carl a clear mandate to the Norwegian throne on 18 November, and the prince accepted the same evening, choosing the name Haakon, a traditional name used by Norwegian kings. The last king with that name was Haakon VI, who died in the year 1380. The new king therefore became Haakon VII, while his son Alexander was renamed Olav and became crown prince. The new royal family arrived in the capital Kristiania (later renamed Oslo) on 25 November. Haakon VII was sworn in as king of Norway on 27 November. The coronation of King Haakon VII and Queen Maud took place in Nidaros Cathedral in Trondheim on 22 June 1906. This was the last coronation held in Norway. Bjørnstjerne Bjørnson, Norwegian writer and the 1903 Nobel Prize in Literature laureate. Erik Gustaf Boström, Prime Minister of Sweden between July 1902 to April 1905. Hjalmar Branting, Swedish politician, future Prime Minister of Sweden. Sigurd Bødtker, Norwegian theatre critic. Karl Sigwald Johannes Bull, Norwegian military officer and politician. Wilhelm Christopher Christophersen, Norwegian diplomat. Øvre Richter Frich, Norwegian reporter, newspaper editor and crime writer. Haakon VII of Norway, known as Prince Carl of Denmark until 1905, he was the first king of Norway after the 1905 dissolution. Thomas Heftye, Norwegian military officer, engineer, sports official and politician. Gunnar Heiberg, a Norwegian poet, playwright, journalist and theatre critic. Frederik Hilfling-Rasmussen, Danish-born Norwegian photographer. Sigurd Ibsen, Norwegian author, lawyer and statesman, who served as Prime Minister of Norway in Stockholm (1903–1905). Maud of Wales, British-born princess, Queen of Norway as spouse of King Haakon VII. Christian Michelsen, Norwegian shipping magnate and statesman, and first Prime Minister of an independent Norway in 1905. Fridtjof Nansen, Norwegian explorer, scientist, diplomat, humanitarian and the 1922 Nobel Peace Prize laureate. Whereas the 1814 independence movement in large part was driven by political opportunism among the national elite, the 1905 movement was a result of political trends largely driven by elected officials with massive popular support. In 1905, Norway was not put in play by war as a territorial prize. By 1905, Norwegians had established many of the institutions and infrastructure of a sovereign, independent state. By 1905, European statesmanship was more inclined to favour Norwegian independence than in 1814. Much has been made of the supremacy of diplomacy in averting war between Sweden and Norway in 1905. In truth, the Norwegians had much more to fight for than the Swedes if it had come to war. Both parties recognized that their geographical proximity made long-term hostility untenable under any circumstance. Many documents related to the specific events of 1905 were destroyed during and following those years. Some historians speculate that foreign interests played a stronger role than had previously been assumed; in particular, that Great Britain influenced the dissolution in order to reduce German influence over Atlantic ports. Although Sweden's close relationship with Germany did not last long, Norway's independence immediately put it inside the British sphere of influence. ^ "Britene ønsket å sprenge unionen". Aftenposten.